Call (816) 415-2267 today for the best deals on RV's in Missouri, Kansas, and the Entire Midwest! Liberty RV is the Premier Missouri RV dealer to shop when looking for the best value and savings. 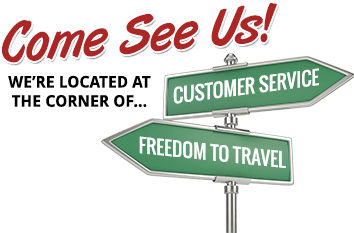 Liberty RV is Kansas City's most affordable and friendly RV Dealer. We carry RV's and Campers and such lines as Cherokee, Grey Wolf, Wolf Pup, Rockwood Signature, Rockwood Ultra Lite, Rockwood Mini Lite, Sprinter Limited, Sprinter Campfire, Impact, Columbus, Bullet, Bullet Crossfire, Bullet Premier, Colt, Lacrosse. We also sell used campers, used RV's, take RV and camper trade-ins, and provide camper and RV service, parts, and accessories for most RV's and campers in the industry. Come on by and visit us! Our experienced, friendly staff is ready to help you with your camper needs! If you need an RV or Camper in Kansas City then Liberty RV is the best RV dealer for your money! Make sure you come and see us on Facebook. Just type in Facebook.com/LibertyRV. Liberty RV serves the Kansas City Metro, the states of Missouri, Kansas, Iowa, Nebraska, and can offer the best prices on RV's to customers all over the United States.